Santec presents a newly developed Rubber Injection Moulding Presses with an advanced injection unit FIFO to obtain excellent product quality. These innovative machines employ two-stage material supply for greater precision. The system feeds and inject raw material in a way that there is no wastage. Santec's Rubber Injection Moulding presses are perfectly suitable for moulding products with simple to the most complex geometry. The injection moulding process combines an extruder, which heats and fluxes the rubber with the help of reservoir & mould. While the rubber mold is curing, fresh rubber is prepared for the next cycle. This semi-automatic process saves the valuable time and energy. The compound used for injection moulding are optimized. They smoothly flow through the nozzle & runner system and fill the mould under controlled pressure. 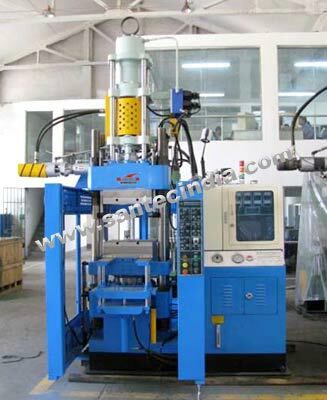 The material to be injected do not cure in the process, but curing is quick once it enters the mould.